There has been a continuing debate amongst fly anglers since the advent of indicator use over a decade ago whether using indicators is a legit method of fly angling....Well it is undisputable effective method of hooking trout when none are showing at/near the surface. 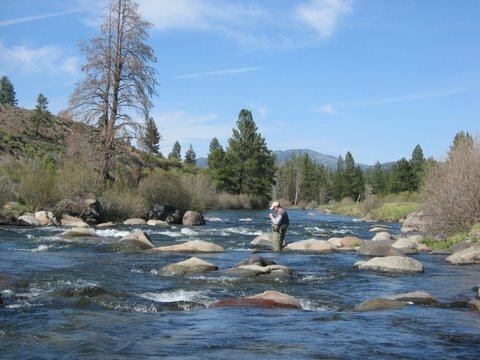 "...any stream you might want to fish in the winter. Envision its flows and think about..."soft spots", where the water is relatively deep but the current is gentle...eddies...edges...pools or in deep runs. Wherever it happens, and the trout are not forced to fight constant current, that is where you find fish in the winter". *Although it is early spring I feel that the below advise is still appropriate because of the existing snow-pack and its anticipated melt...resulting in high and cold water flows. CyberFly! is Alive #6... and Breathing! 1---Karen, my partner, had major open-heart surgery last November; it has been a year. She is fully recovered and is now back to her 3-5 mile hikes with her hiking buddies. I was the essential in-house, care-giver for the first few months; that kept me busy. A big shout-out to several of her devoted friends who were really helpful; I thank them. 2---During the month of February I prepared for and manned my annual booth at the Pleasanton Fly Fishing Show and refreshing my PowerPoint presentation for the show's Destination Theater. I love doing the show because it is an opportunity to catch-up with a lot of friends and clients....plus meeting some new and enthusiastic fly anglers. 3---In April, my guiding and scheduled school clinics' season commenced, although I selectively guided; mostly long-time clients. 4---In June, thinking I should join the 21st century, I decided to update my antique web-site that I put-up in 1996! Since there has been little changes, except for my annual tweaking of the homepage and inserting pertinent rates & dates for my guiding, clinics and Native Sons Tours. So I then engaged the services of a professional web-design firm. It has been a lot of work and hopefully it will be launched by the new year. 5---During late August we visited family in Seattle. I also had the opportunity to drift-fish the Methow River for two days. There I netted my first Bull Trout. 6---During September I made a trek to Twin Bridges Montana. From there we drift-fished the Big Hole and Madison rivers once each, and two days floating on the Jefferson. We experienced productive angling; most especially on the lesser-known Jefferson. PS...The only political discussion and opinions that will occur on this blog is fishery politics..most especially as it may pertain to the two below imaged moving waters...that I'm likely to do.